← Infinity is weird: what’s bigger than big? I’ve been reading and blogging about the works of Basil Copper (here, here, & here) over the past few months, and have a nice backlog of his works to go through. Most recently, I finished the second of his collection of short stories released in the United States, And Afterward, the Dark (1977). 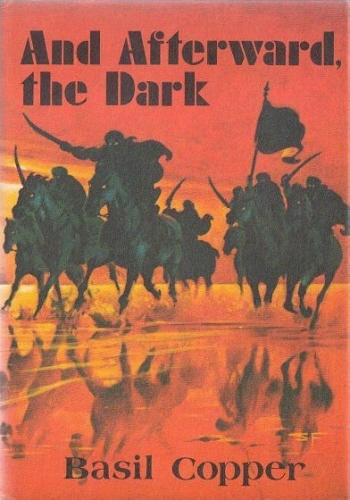 Like From Evil’s Pillow before it, And Afterward, the Dark was released by classic publisher Arkham House in a relatively small printing of several thousand copies. Also like its predecessor, it contains a number of so-so stories and a number of very good stories, in my opinion. The Spider. When M. Pinet decides that he is too tired to finish his journey to Paris that evening, he stops at an inn at a tiny village for the night. He gets much more than he bargained for, as the inn has few human tenants but many more of another variety. The Cave. In a discussion about the nature of fear, Wilson describes his most terrifying experience. It starts with his vacation in Austria, his stay at a remote inn in the mountainous wilderness there, his discovery of a cave of sinister import, and ends with the thing that follows him back from the cave. Dust to Dust. Mr. Appleton believes that he has found the perfect house in which to finish his monumental writing project. The only problem is that the windowsill in his study seems to get covered with dust with almost supernatural regularity. When words start to appear in that dust, Mr. Appleton realizes he is in contact with a force from beyond this world. Camera Obscura. Mr. Sharsted, a money-lender with a distinct lack of scruples, has returned to the home of antiquarian Mr. Gingold to settle accounts with the man once and for all. When Gingold offers to show Sharsted one of his acquisitions — a camera obscura — he gives Sharsted one final chance to atone for the treatment of his clients before casting him into a hell of his own making. Archives of the Dead. Because poet Robert Trumble has been down on his luck in recent years, he jumps at the opportunity to work as the personal assistant of occult research Dr. Fabri, in spite of the man’s reputation. Trumble has plenty of freedom and time to pursue his own interests, and his only job is to organize scrapbooks of obituaries of people who, in Dr. Fabri’s own words, “interest me.” When Trumble chances to meet some of Fabri’s evening visitors, however, he begins to suspect that Fabri has more than a passing interest in the people whose deaths he follows. The Flabby Men. Set in a post-apocalyptic future where humanity is organized but scattered in remote outputs, a narrator describes his assignment to a sinister island, occupied only by a small number of villagers. The nuclear holocaust has caused new and terrifying life to form in the darkest depths of the earth, and the narrator will see first-hand the beginning of an invasion of the worst of it all: the flabby men. As I noted, the quality of these stories range from excellent to mediocre. The best of them are The Cave, which captures well the terror that comes with facing the unknown, and The Flabby Men, which presents an extremely bleak future and manages to make it even worse by the story’s end. The most mediocre, in my opinion, are The Spider (which, to be fair, was Copper’s very first published story) and The Janissaries of Emilion, which is rather predictable from the very beginning. The Flabby Men is quite horrific, and is perhaps the best of the entire book. I was struck by the rather nasty glimpses of Copper’s future society where, among other things, women are now only referred to as “breeders” and are better known by their number than their name. This was bad enough, but the horror is compounded by The Flabby Men, a particularly loathsome and frightening group of monsters that genuinely made me shudder. For those curious about the nature of the optics in the story Camera Obscura, I have written about small versions of such devices before. 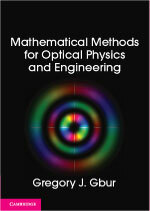 In short, a small pinhole allowing light to enter a darkened room can create a perfect (inverted) image by simple geometric properties of light. 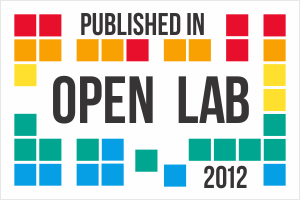 An example, from Wikipedia, is shown below. 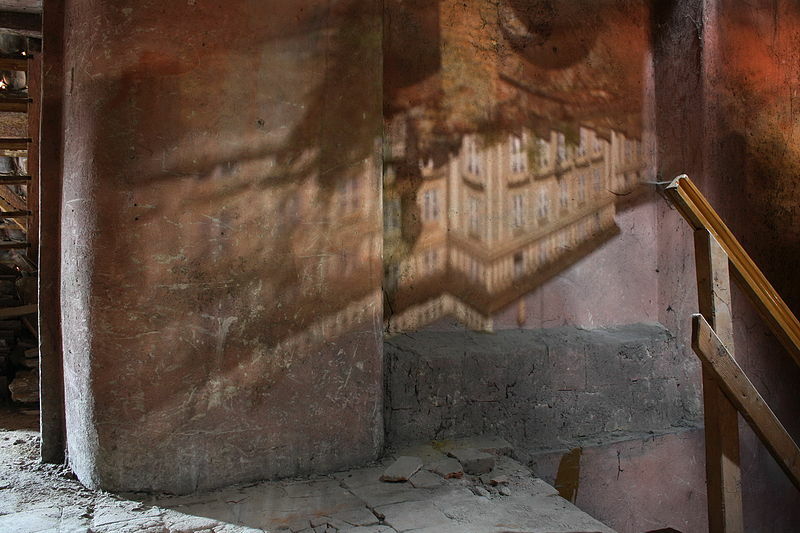 In the mid-1800s, it became quite popular to use this effect in camera obscura buildings, reflecting light from an opening in the roof down into a darkened chamber below. One of these is still in existence in San Francisco, simply known as the Camera Obscura. It is a chamber of this sort that is used in Copper’s story. 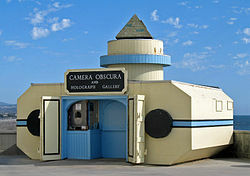 Camera Obscura, in San Francisco (via Wikipedia). I had one more pleasant surprise about my particular copy of And Afterward, the Dark that I discovered when writing this post: it is signed by the author himself! 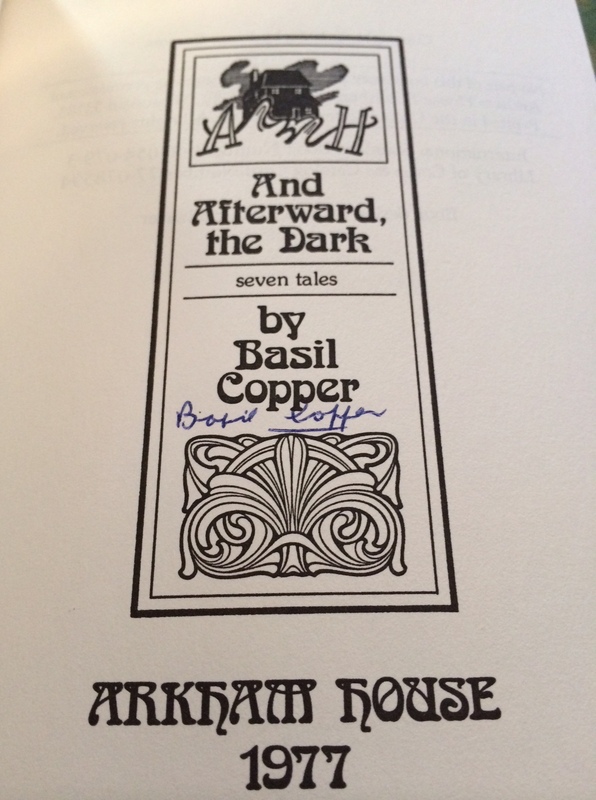 I’m not sure if Copper signed a number of copies when the book was first published as a promotion, or if I got a copy that was signed later, but the signature agrees with others that I have found online, so I assume it is genuine. So, overall, And Afterward, the Dark is an enjoyable collection, with some very good stories and some that are simply okay. It does show that Copper was significantly better than the average horror author of his day, and the collection is worth exploring for those fans of unusual horror.